Home » coal , event , rewards , snowflakes , steel , world of warships » World of Warships: 0.7.12 Develpers Diary Video "Snowflakes"
World of Warships: 0.7.12 Develpers Diary Video "Snowflakes"
“Snowflakes” will be a new festive special event that’s set to last throughout Update 0.7.12. You are probably well aware by now that your first win of the day with each ship scores an XP bonus, right? “Snowflakes” is a bonus you can claim the same way, but only one "Snowflake" per ship per update. To knock a Snowflake off any of the Tier V-X ships in your port, you need to win a battle of any type with each ship, Clan and Training Modes are excluded from this event. 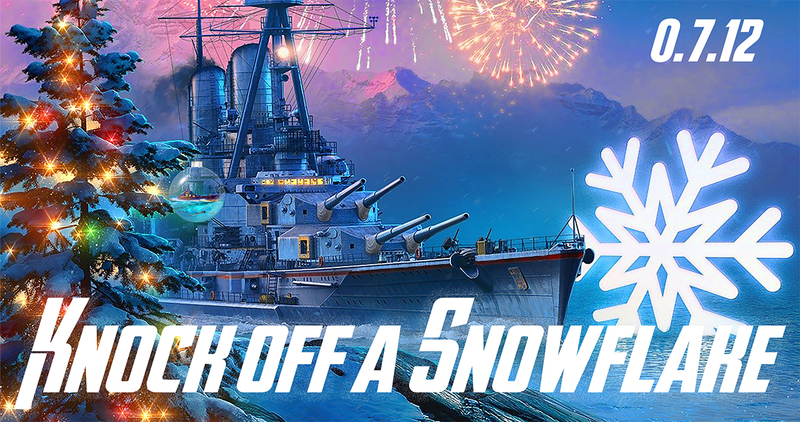 "Snowflakes will be available once per ship, even if you buy the respective ship during the course of update 0.7.12! :)"
WG have admitted that they understand Steel is a valuable resource that is "mined" in Clan and Ranked Battles in order to get rare ships. But since adding it to the game, WG have received many requests to make it more accessible, as not all players have the opportunity to play in the competitive modes efficiently enough or on a regular basis. The event mentioned above was designed to fire up the New Year celebrations and give all players a chance to obtain valuable rewards with the use of Steel! However, it does not mean WG are planning to offer such specials on a regular basis. IMPORTANT! Because this event is still being tested, the information in this Article is tentative and reflects the state of game development at the time of its publication. Changes and new features may be removed entirely or implemented differently by the time the Update goes live. Screenshots, specific values of certain characteristics, and details of in-game mechanics will not necessarily be relevant after the event is released.